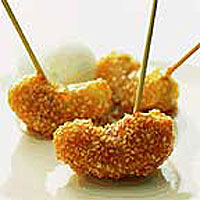 This recipe is ideal for Halloween or Bonfire Night parties as an alternative to toffee apples. The apples are cut into segments or cubes, making them easier to eat than a whole apple. Chill the apples in the fridge for a couple of hours before making this recipe. Place the sugar in a pan with 100-120ml cold water and heat slowly, without stirring, until it dissolves completely. Once the sugar has dissolved, bring to the boil and bubble rapidly, until it begins to colour. Meanwhile, using a strong pair of scissors, cut 8 bamboo skewers in half and snip off the pointed ends. Using a small, sharp knife, cut each apple into 8 wedges and slice away the core. Pat dry with kitchen paper and firmly push a skewer into each wedge. Once the sugar has reached a light golden toffee colour, remove from the heat and stir in the sesame seeds. At this point the mixture will foam up. Allow it to subside then, using the skewers, dip each segment fully in the toffee mixture. Place on silicone paper to set. The toffee in the pan will continue to darken as you dip so you will get an attractive range of caramel shades on your wedges. Take care as the toffee is hot, but work quickly or it may set before you have finished dipping - if this happens, gently warm the toffee again. The toffee from the dipped wedges may form little puddles if it is quite soft. Once the toffee has set but is still a little warm, serve the apple wedges either lollipop style, or in a bowl with a scoop of sorbet. After about 10 minutes the apple juice from the cut surfaces will begin to melt the toffee, so do not make these ahead of time. To clean the pan, fill with cold water and bring to the boil to melt the caramel. Then drain and wash in hot, soapy water.